The new High Commissioner for Human Rights needs to re-energize the United Nation’s (UN) advocacy work on the ground to protect civilians and others whose rights are threatened. This includes the work of his Office (OHCHR) and that of the UN’s human rights field officers. But it also requires holding accountable the UN system so that its many components fulfill their obligations to defend human rights. Humanitarian and political agencies and actors in the UN system often look to OHCHR to be the ‘bad cop’ who will publicly criticize rights abusers, thus easing the pressure they might be under to speak out. Of course, the new High Commissioner must speak out, but he also needs to ensure his colleagues in other UN bodies are not let off so easy. The whole UN is supposed to stand up for human rights – and it has not been doing a very good job of it. Human rights advocacy in the field is a powerful tool, consistently underestimated by UN officials. Staff in the UN’s 50+ human rights field presences can achieve real protection for people suffering abuses, even in countries where from Geneva or New York the situation may seem hopeless (in fact, the impact of field-based protection is especially important in countries where progress is not happening at the international level.). Those engaged in international discussions are mostly unaware of this protective action in the field, where UN staff is in daily contact with local authorities, armed groups, and civil society, pushing for change. Incrementally, with each push, there is change. 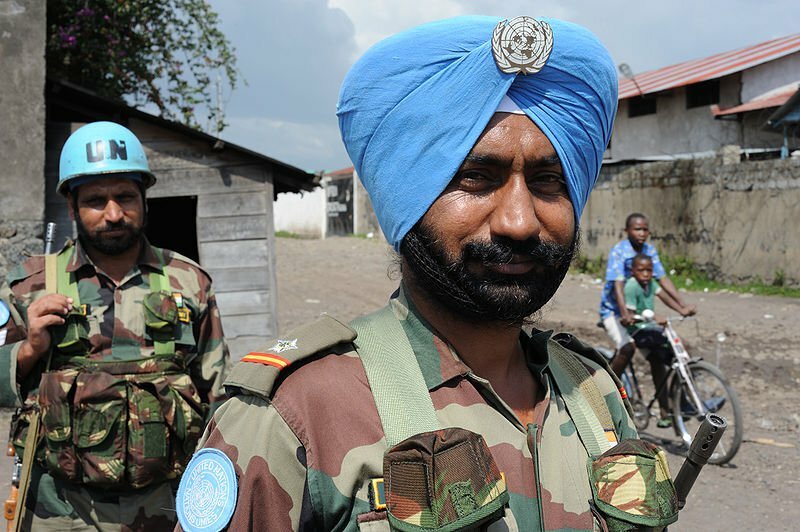 UN peacekeepers in the Democratic Republic of the Congo. When staff in a human rights field presence pushes steadily, they develop a credibility that reinforces the high-level diplomacy of heads-of-missions and human rights allies in New York, Geneva and other centers of power. Unfortunately, neither OHCHR nor the UN as a whole have made the necessary operational investment to take advantage of this potential for human rights protection on the ground. The outdated, stereotyped perception remains that delivering assistance or deploying peacekeepers is operational, but human rights advocacy is not. But carrying out human rights work on the ground is a massive operational challenge: it requires substantial staff deployment, vehicles, helicopters, radios, interpreters, security experts and a network of sub-offices with adequate logistics. Human rights staff are not just sitting at desks: they have to be ready to travel at any moment to a village to inquire into an emergency, and put on a suit the next day to raise concerns about it at the highest levels of government – or to their own bosses. They need constant training in political analysis and flexible diplomacy. All of this demands investment. Even with increased resources, OHCHR is going to have to do a much better job in many aspects of its performance. The new High Commissioner will need to be much more demanding of his staff than his predecessors. The insufficiency of OHCHR’s field presence diminishes its credibility in the eyes of larger field-based agencies. Its often overly-legalistic approach to interagency protection debates have frequently earned it a reputation for being uncooperative. Its excessive staff investment in Geneva at the expense of the field further weakens its credibility. There are powerful forces resisting a strengthened OHCHR role in the field. They include member states that resent international human rights interference. But resistance will also come from more mundane budgetary pressures, exacerbated by the fact that even OHCHR’s apparent allies among member states do not sufficiently understand the potential of its fieldwork, so they do not adequately defend it. A larger and better-supported field presence of human rights officers is urgent and essential, but it is certainly not enough. The High Commissioner must also be a clear voice that insists that the whole UN take its human rights advocacy obligations much more seriously. Although OHCHR must necessarily speak out boldly, it should not simply accept the ‘bad cop’ role. The field presence of humanitarian actors and peacekeepers vastly outnumbers human rights workers. These institutions have all-too-often evaded their human rights advocacy responsibilities, standing by silently while mouthing phrases like ‘mainstreaming human rights’. Mainstreaming does not mean that other UN bodies get off easy on their human rights commitments. It means that they, like OHCHR, are supposed to be effective vocal advocates for the protection of people’s rights. At a December 2013 Consultation on the Protection of Internally Displaced Persons in Geneva, the United Nations High Commission for Refugees (UNHCR) was under fire for the poor performance of the UN Country Team in Sri Lanka, and for the dramatic failure of advocacy by UNHCR itself, ostensibly the lead agency for protection in the country. But rather than promise any change, the High Commissioner for Refugees, Antonio Gutierres, argued that UNHCR might simply develop a more active partnership with OHCHR so that OHCHR could do the necessary advocacy and UNHCR could stick to more ‘operational’ assistance tasks. No senior UN official should be able to ignore or back away from addressing urgent protection needs. The new High Commissioner for Human rights needs to take on the unpleasant responsibility of holding UN agencies and officials more accountable in this respect. In essence this is ‘Rights Up Front’ – the new strategy announced by the UN Secretary-General. All UN actors have a greater human rights responsibility, and the High Commissioner for Human Rights must monitor how it s fulfilled. Even while OHCHR gets its own house in order and expands its field presence to more effectively earn this leadership role, the High Commissioner for Human Rights can act now to ensure that those who are selected for key positions of power in the UN system have the necessary human rights experience and commitment. His Office should aim to wield more influence in the selection of the Secretary General’s Special Representatives and UN Humanitarian Coordinators, to try to ensure that these crucial posts are filled by people who will include human rights protection among their key priorities. A High Commissioner for Human Rights cannot do his job if he is a lone voice without UN allies, nor can his representatives in the field. There would be no need for a ‘bad cop’ if the rest of the system’s key players worked together to achieve the UN’s human rights commitments, even when it means engaging in advocacy that will not always make UN member states happy.